Singer and songwriter Johnny Malone met saxophonist and flautist Allan Barnes while they were students at Howard University in Washington DC in the 1960's. In addition to being under the tutelage of Donald Byrd who was head of Jazz Studies, they were classmates with future stars like Donny Hathaway, Leroy Hutson, and Angela Winbush. Barnes was already a member of the hugely popular soul jazz pioneers The Blackbyrds. "We were at crest of the wave of early jazz fusion, plus the culture at Howard was a little outside of the box. We had great teachers – it was an ideal place to study and learn," explains Barnes. When the two friends formed Malone Barnes and Spontaneous Simplicity (named after the tune by Sun-Ra, whose band Barnes regularly appeared with when in Washington, DC) the collaboration yielded Freedom Serenade, an album of super spacey and spiritual jazz funk. Released in limited quantity in 1976, on their Humpin' International label, this rare and underground album bears the hallmarks of contemporaries like the Blackbyrds, the Mizell Brothers and DC neighbors Oneness of Ju-Ju. "Warp Ten" features a solo battle between Barnes and trumpeter Curtis Pope (of the Isley Bros and Wilson Pickett bands). Songs such as "Moonstruck" and "Journey to the Stars" are DJ-friendly futuristic funk tracks with a sci-fi flavored nod to peers Funkadelic and Parliament. Freedom Serenade was a tribute to Paul Robeson who died in January of the year the album was released. The multi-lingual American actor, athlete, bass-baritone concert singer, writer, civil rights activist, Spingarn Medal winner, and Stalin peace prize laureate was a huge influence on the duo. "My father raised me on Paul Robeson," says Malone. "I was enamored, he was such a great individual being intellectual, athletic and an artist – I don't have enough words to describe him, we all admired him," he adds. The album features the nucleus of the Malone Barnes and Spontaneous Simplicity group and some well-known local guests. Johnny Malone was on lead vocal, piano, clavinet, and synthesizer, Allan Barnes on "afro horns," clarinet and flutes, Tom Newman on guitar John Bebbs on drums, Siggie Dillard on bass, Andre Richardson on congas, timbales, percussion and Delbert Taylor playing trumpet, vocals and piano. Guests included Brian Jackson, of Gil Scott Heron fame, and Curtis Pope, music director for Wilson Pickett, on trumpet amongst others. "Curtis Pope would talk trash to any other trumpet player apart from Delbert," remembers Barnes. "He was very flamboyant but a world class and very fine player. And together with Delbert they really had an incredible sound." The album recording process began in Virginia in a studio owned by Lloyd Price. But disagreements over mixes for a single meant that certain tracks were remixed at Sound Factory, Westlake studios, the Hit Factory and even Electric Ladyland. Multiple backers were interested in the album and helped fund the mass mixing sessions. Eventually "Road Man" and "Journey to the Stars" were released on a limited run 7" single. Unfortunately the tapes for the different mixes have long been lost. Inspired by a live performance by Malone Barnes, Alfred Smith painted a picture which hung in the lounge at the University of DC. 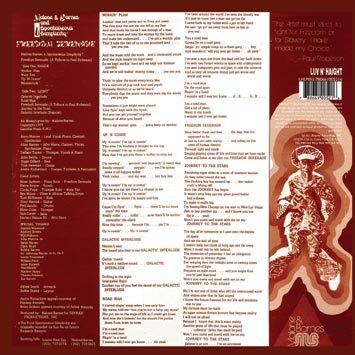 Smith made a copy for the band who used it for the album art to Freedom Serenade, although to keep costs down they re-produced the art in cepier tone. Prior to meeting Barnes, Malone was in a band called Odyssey which went on to became the Final Frontier. Their name was inspired by the introduction to the TV show Star Trek and was meant to illustrate the idea of playing the opposite of "inside", by playing in outer space. Barnes and Malone met when Malone's father insisted he go to Howard because it was a good school that was closer to the family home. Allan was already in the Blackbyrds and released several albums before leaving Howard. After leaving the Blackbyrds line-up Barnes joined Malone in a band called Golden Story and they played a regular gig at the Sagittarius club in DC. The band was named after a series of books Malone read as a child. And just like the books he had hope that the combination with Barnes would have a fairytale ending. However, the gig did not last more than a few months. 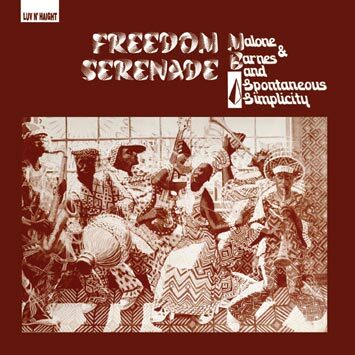 Barnes went on the road but returned to record Freedom Serenade as Malone Barnes and Spontaneous Simplicity in 1976. After the albums release family commitments took Barnes to the West Coast while Malone went to work with Carl Pope. Washington DC was a musical melting pot and both Malone and Barnes rubbed shoulders with many musical greats over the years. Malone was friends with Hilton Felton and used to hang out and practice. Coincidentally their sons are now friends and also recording and releasing music together. Barnes managed Hot Tea, a group made up of Elette Boyce (who guests on Freedom Serenade), Tawatha Agee (of Mtume), and Angela Winbush. Louise West was their attorney, and is also listed as a booking contact for Malone Barnes and Spontaneous Simplicity on the original LP art. She went on to have success as attorney for Zulema, Al Jarreau and later in life with Timbaland and Missy Elliot. Malone and Barnes' writing and playing skills also surfaced on work released by other artists. They co-wrote several tunes putting A Taste of Honey on the map with "Boogie Oogie Oogie" and "Disco Dancin'". Later on Malone joined The Exciting Allan Barnes Band on the West Coast after coming out of retirement for 3 or 4 years in the early 1980s. Together again they released a follow-up album in 1984 called "The Caretaker" which featured Fred Wesley on trombone and Larry, Fonce and Rod Mizell on production.